Sujal and I took a quick weekend trip down to Washington, DC for our first anniversary. Here is a little “anniversary blogging” by the White House. 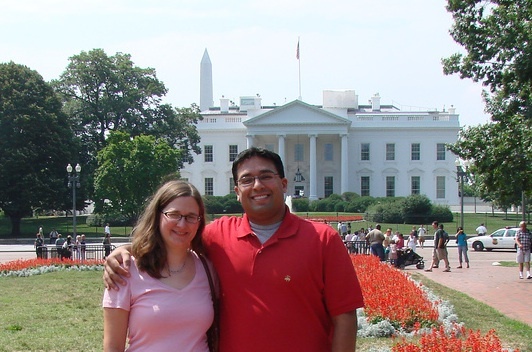 Those of you who know Sujal well know that he has quite an affinity for the current White House resident, as do I. It was a beautiful memorial, and it was very traditional, but Sujal and I both felt it lacked something. For me it lacked the personal quality the Vietnam War Memorial has. Nonetheless, it is a beautiful piece of artwork. While there, I read an inscription that was a quote (now I don’t remember the particulars) about the naval force (I think?) being victorious. I mentioned to Sujal that I know that the US was “victorious” in WWII, but that I had never really thought of it in those terms. I don’t really think of wars as ever being victorious. Of course I know wars are fought to be won, but I don’t believe that wars have winners. That is not to say that I don’t believe the US should have been involved in WWII. Hitler needed to be stopped for sure! But I still do not think of the US as being “victorious.” Yes, we “defeated” Hitler, but we lost a lot. I think of the poem “Dulce et Decorum Est” by Wilfred Owen. These potential semantics made Sujal question me on my comment. This line of thinking demarcates a zone where Sujal and I do not think alike. We have very different ways of conceptualizing and perceiving the world, thus it led to a bit of a confrontation. Being the established married couple we are (we are not newlyweds anymore), we easily weather all disagreements. 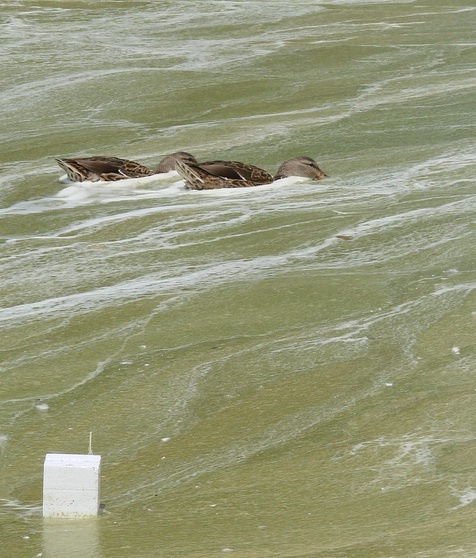 These two ducks were in the sludge with their little beaks in the muck. Somehow it just seemed like a metaphor for the state of our current administration. Sujal and I had been talking about Dickens on the ride down, and this was just too Dickensian of a symbol to pass up. After a long, hot walk, we finally arrived at the History museum, to find out it was closed for renovations. We then headed to the National Gallery. I really wanted to see one of my favorite paintings — it hangs there. I saw it twice before, and I love it. So we went to find it in the wing of American art — also closed for renovations. Then I recalled that sometimes the artist is groups with the French Impressionists. I asked at the info desk, and yes, Mary Cassatt is grouped with the French Impressionists. The clerk asked which painting I was looking for, and I told her that it was Child in a Straw Hat. She looked it up and said that it was not on display at this time. I was a little heart broken, but I somehow managed to go on. We went to the Air and Space Museum next. After seeing a few exhibits, we went to see an Imax movie called Adrenaline Rush which was about skydiving and base jumping. It was decent — the camera shots were beautiful, but the script was really cheesy. Then we went to see Cosmic Collisions, a planetarium show narrated by Robert Redford, which was also decent. After getting our space ice cream, we hoofed it back to our hotel. We stayed at the Topaz Hotel, a very trendy and eco-friendly hotel in DC. It is part of the Kimpton Group, trendy, eco-friendly fairly upscale hotels. We really liked the place a lot. It is decorated in a modern and eclectic fashion, so it is kind of funky. We definitely recommend it, especially during a summer weekend, because we got a really cheap rate! We then went out for a lovely dinner at Raku — An Asian Diner. We were so hungry, that it tasted like one of the best meal we’ve ever had. It was good, too. We each had pad thai. I also had the vietnamese spring rolls. I love them! I used to order them whenever I went to Lotus, a restaurant in Minneapolis. Vietnamese spring rolls are tough to find around here. The next morning, we met Sujal’s friend Kim for a lovely brunch at another Kimpton hotel. Then we headed home on another traffic-filled highway. Of course we made a pit stop in New Jersey where Sujal got me a great anniversary gift (I’d already given him his). All in all, it was a pretty great first anniversary. We’ve both been fairly busy (he more so than me), so it was good to spend some time together.